Baseball is in swing, and the weather is finally resembling spring. I went to my first game of year Sunday. The Yankees lost to Tigers 10-7 , but had good time regardless. Anyways I sat behind the left field wall and one of my new favorite Yankees, Brett Gardner. He is a joy to watch in the field, and was highly rewarded last year for his glove. Soft pastels on Strathmore Charcoal paper. 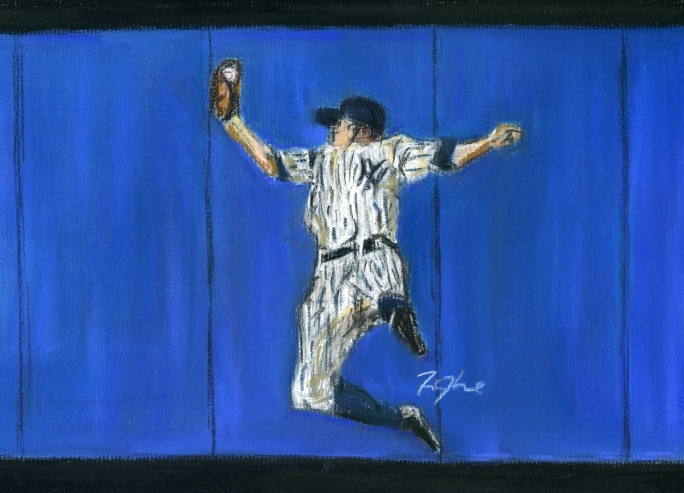 ~10" x8"
This entry was posted in Art and tagged Brett gardner, New York, Yankees. Bookmark the permalink. Nice. I love how the uniform pops against the blue wall.